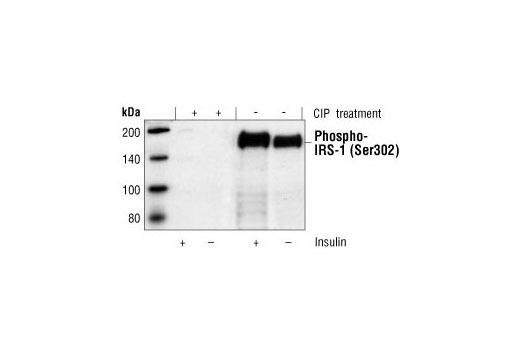 Western blot analysis of extracts from CHO IR/IRS-1 cells ( transfected with insulin receptor and IRS-1), untreated or insulin-treated (100 nM for 5 min), showing an increase in phospho-IRS-1 (Ser302) with insulin stimulation, using Phospho-IRS1 (Ser302) Antibody. To confirm phospho-specificity of the antibody, a duplicate membrane was treated with calf intestinal alkaline phosphatase (CIP) after Western transfer. Phospho-IRS-1 (Ser 302) Antibody detects endogenous levels of IRS-1 only when phosphorylated at Ser302 of mouse IRS-1 or Ser307 of human IRS-1. This antibody does not detect IRS-1 phosphorylated at other sites. Polyclonal antibodies are produced by immunizing animals with a synthetic phosphopeptide corresponding to residues surrounding Ser 302 of mouse IRS-1. Antibodies are purified by protein A and peptide affinity chromatography. Insulin receptor substrate 1 (IRS-1) is one of the major substrates of the insulin receptor kinase (1). IRS-1 contains multiple tyrosine phosphorylation motifs that serve as docking sites for SH2-domain containing proteins that mediate the metabolic and growth-promoting functions of insulin (2-4). IRS-1 also contains over 30 potential serine/threonine phosphorylation sites. Ser307 of IRS-1 is phosphorylated by JNK (5) and IKK (6) while Ser789 is phosphorylated by SIK-2, a member of the AMPK family (7). The PKC and mTOR pathways mediate phosphorylation of IRS-1 at Ser612 and Ser636/639, respectively (8,9). Phosphorylation of IRS-1 at Ser1101 is mediated by PKCθ and results in an inhibition of insulin signaling in the cell, suggesting a potential mechanism for insulin resistance in some models of obesity (10). Ser302 in rat/mouse IRS-1 (corresponding to Ser307 of human IRS-1) is phosphorylated rapidly during insulin stimulation and has a postive role in IRS-1 tyrosine phosphorylation. Inhibition of Ser302 phosphorylation by short-term amino acid/glucose starvation correlates with a decrease in IRS-1 tyrosine phosphorylation without inhibition of insulin receptor autophosphorylation or Akt phosphorylation. A defect in this positive regulatory pathway may be a mechanism contributing to insulin resistence (11). Sun, X.J. et al. (1991) Nature 352, 73-77. Sun, X.J. et al. (1992) J. Biol. Chem. 267, 22662-22672. Myers Jr., M.G. et al. (1993) Endocrinology 132, 1421-1430. Wang, L.M. et al. (1993) Science 261, 1591-1594. Rui, L. et al. (1997) J. Clin. Invest. 107, 181-189. Gao, Z. et al. (2002) J. Biol. Chem. 277, 48115-48121. Horike, N. et al. (2003) J. Biol. Chem. 278, 18440-18447. Ozes, O.N. et al. (2001) Proc. Natl. Acad. Sci. USA 98, 4640-4645. De Fea, K. and Ruth, R.A. (1997) Biochemistry 36, 12939-12947. Li, Y. et al. (2004) J. Biol. Chem. 279, 45304-45307. Giraud, J. et al. (2004) J Biol Chem 279, 3447-54.